Sponsorship – bhasin consulting inc.bhasin consulting inc.
bci, in partnership with the Center for Talent Innovation (CTI), has released a new research report that examines experiences with sponsorship in Canadian workplaces. 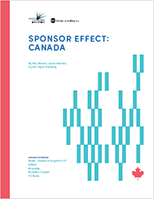 The first research of its kind in Canada, Sponsor Effect: Canada1 explores the challenges faced by people of colour, Indigenous peoples, and women (including the intersections between these cultural identities) in attracting advocacy, and offers recommendations for leaders who wish to create cultures of inclusive sponsorship within their organizations. For years now CTI has spearheaded research on sponsorship globally. According to this research, sponsorship is a powerful relationship that occurs when a senior colleague, or “sponsor” does a minimum of three things for their “protégé”: goes out on a limb for them, advocates for their next promotion, and provides air cover when they make a mistake.2 This represents a higher bar of advocacy and support than does mentorship. Further, the support provided by sponsorship has been identified by CTI as a key tool for advancing the careers of people of colour and women. But our report finds that in Canada sponsorship is rare across the board, and that there is a strong need to leverage sponsorship more effectively in order to increase diversity and inclusion in our leadership ranks. Sponsor Effect: Canada provides data about the experiences of sponsorship in Canadian workplaces, including the barriers experienced by diverse and women professionals. But more importantly, it clearly outlines best practices and recommendations that senior leaders, potential protégés, human resource professionals, and diversity and inclusion professionals can employ to build cultures of advocacy and sponsorship within their organizations. Download the executive summary, or, to purchase the full report, visit CTI’s website here. bci provides targeted programming for key audiences (senior leaders, protégés, human resource professionals, and diversity and inclusion professionals) on supporting diverse and women professionals through concrete, actionable strategies for inclusive advocacy and sponsorship. To learn more about our programming, contact Alyse Runyan at info@bhasinconsulting.com or download our Inclusive Advocacy and Sponsorship Programming Guide here. 1 – Taylor-Kennedy, Julia, Laura Sherbin, and Ritu Bhasin. Sponsor Effect: Canada. New York, Center for Talent Innovation, 2017. Print. 2 – Ibid. Page 5. 3 – Ibid. Pages ix – xi, 15, 22.